Because every child should have a safe place to grow into their best self. Since 1926 campers from around the country and throughout the world have enjoyed fun filled summers at camp Newaygo girl's resident camp. Our 101 acre camp rests along Pickerel Lake which is snuggled in the Manistee National Forest region, near the town of Newaygo, Michigan. If you like spending time in the outdoors, enjoying the sun, having fun on the water, and making lifelong friendships, camp Newaygo is the place for you. There is more to discover though than just a girls' resident camp, we also offer a women's programs, parent & me and family camps, leader in training program and co-ed day camps! Our Mom and Me weekends in June are specifically designed for young children and their moms, grandmothers, aunts or another special female adult. The program offers an opportunity to introduce children (boys and girls) to the joys of camping. Singing around the campfire, canoeing on Lake Pickerel, catching their first fish, or doing crafts together are more fun together when all the planning and preparation are done for you. And, no cooking all weekend! For woman who are looking for a weekend to themselves and relax, try our Girlfriends-Get-Away retreats. Spend the night in our campy chic dorms - which are heated and cooled - just a few steps away from our restrooms and showers. Sign up to be pampered with an on-site massage, manicure, or pedicure. Enjoy crafts, waterfront time, hikes, great food, and a beautiful facility with women from all over the country. 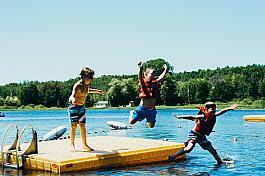 Camp Newaygo is busy year round with retreats, and family events. Check out our website for our calendar of events! *Weekend holdovers are available for campers staying more than 1 session between sessions 2 & 3, 3 & 4, and 4 & 5. 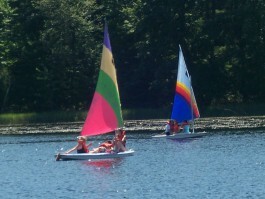 Be sure to check out our website at www.campnewaygo.org for all the up-to-date information including dates, rates and pictures showing the great time you can have at Camp Newaygo! The summer camps at Pendalouan are where imagination and adventure come alive. With over 90 years of creating great summer memories, Camp Pendalouan has the foundation to provide a safe and treasured summer camp experience. Our traditions build friendships that go beyond a canoe ride to Turtle Bay or sharing a bench and watching flickering stars above the campfire. At Pendalouan, we specialize in helping kids make life-long friends. Sign up for a mix of traditional camp activities and environmental learning, led by professional and well-trained staff. Monday through Friday, 9:00 a.m. to 5:00 p.m. Swimming, canoeing, rowboats, the climbing wall, archery, songs, crafts, hands-on science, and many other outdoor activities are available to Day campers at Pendalouan. Hiking to Turtle Bay or visiting our horses at the barn round out a full week curriculum that guarantees good memories and tired but happy kids at the end of each day. Travel to and from Muskegon-( 560 Mart St, Muskegon, MI 49440) or the White Lake Area Chamber of Commerce (124 W Hanson St, Whitehall, MI 49461) is available for $30 per week. In addition, extended day (early drop-off or later pick-up) options can be arranged. From traditional Family Camp to specialty programs like Mom & Kids and Father & Son, Pendalouan's family programs are a unique way to unplug from distractions and connect with those that mean the most! Enjoy relaxing on the banks of beautiful Big Blue Lake: paddle clear waters in a kayak or canoe; enjoy wooded paths on horseback; or nap with the sounds of nature in our hammocks and swings. Qualified staff runs fun and safe activities, including: crafts, target sports, high ropes course and zipline, hikes, campfires and outdoor cooking. Circle Pines Center is located about 35 miles southeast Grand Rapids in beautiful Barry County, near the Yankee Springs Recreation Area. Our co-ed residential camp program, open to youth ages 7-17, combines elements of a traditional summer camp (swimming, sports, campfires, hikes, theater, dance, arts and crafts) with cooperative work projects (construction, organic gardening, trail maintenance and cleaning). In addition, educational activities focus on topics like climate change, food politics, social justice, ecosystems and the importance of critical thinking. Our focus on cooperation as an interpersonal strategy and viable economic alternative is embodied in our daily chores, work projects, decision making, camp store and other activities. We also offer several weekend programs for families thoughout the year, such as Maple Syrup Weekends, Apple Cider Weekends, Spanish Immersion Weekends, and the Buttermilk Jamboree music festival. Circle Pines is committed to supporting sustainable agriculture and the slow food movement. Kitchen staff members work hard to provide delicious and nutritious meals from scratch using primarily local and organic ingredients. We source camp food from over 15 local farm families in Southwest Michigan. Meat dishes are prepared using pasture fed and humanely raised animals. Given advance notice, CPC can accommodate most dietary restrictions and allergies. Vegetarian alternatives are always available.